Are You Still Having Pain After An Ankle Sprain? Ankle sprains are one of the most neglected injury in sports. Most athletes sprain their ankle, ice it for a day or two, tape it, and then jump back on the field. I rarely see people take a few weeks off after a grade I or borderline grade I to II ankle sprain. I only see athletes take an extensive amount of time off when it is a really severe sprain (grade III) and they can’t put any weight onto their foot at all. When I see athletes following an ankle sprain in my clinic it’s usually when they have had a minor ankle sprain that just won’t seem to heal, even sometimes 2 to 3 months later. I typically fix these cases in 2-3 sessions because they generally present with same problem. The biggest reason for lingering pain is something called anterior impingement syndrome. If you look at the picture below the anterior talofibular ligament connects the lateral malleolus (lateral ankle) to the talus (bone in the front of the ankle). This ligament is the most commonly injured ligament in traditional ankle sprains, inversion ankle sprains, where your foot turns inward. 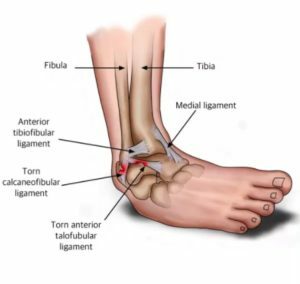 What commonly happens, since the anterior talofibular ligament connects one bone to another, is that when the ligament tears the lateral malleoli bone shifts; typically forward. This forward shift of the bone ends up causing the anterior talofibular ligament to be caught between two bones and keeps it inflammed. This is why these athletes will typically have pain with dorsiflexion (foot lifting toward the shin motion), swelling, and point tenderness directly on top of the ligament for months after the initial sprain. The key to fixing these athletes is to set the lateral malleoli back into the right position, eliminate any scar tissue/inflammation in the front of the ankle joint, regain dorsiflexion range of motion, and strengthen the foot and ankle. I will usually perform active release techniques (ART) or use an instrument assisted soft tissue mobilization (IASTM) tool to eliminate scar tissue. I will then tape the lateral malleoli in the proper position and focus on dorsiflexion. Followed by strengthening and stability training to the foot and ankle. 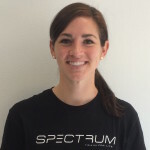 If you or anyone you know is struggling from pain after an ankle sprain, feel free to give us a call at 321-218-0435 or email me at jakubowski@spectrumsp.com to set up an appointment!